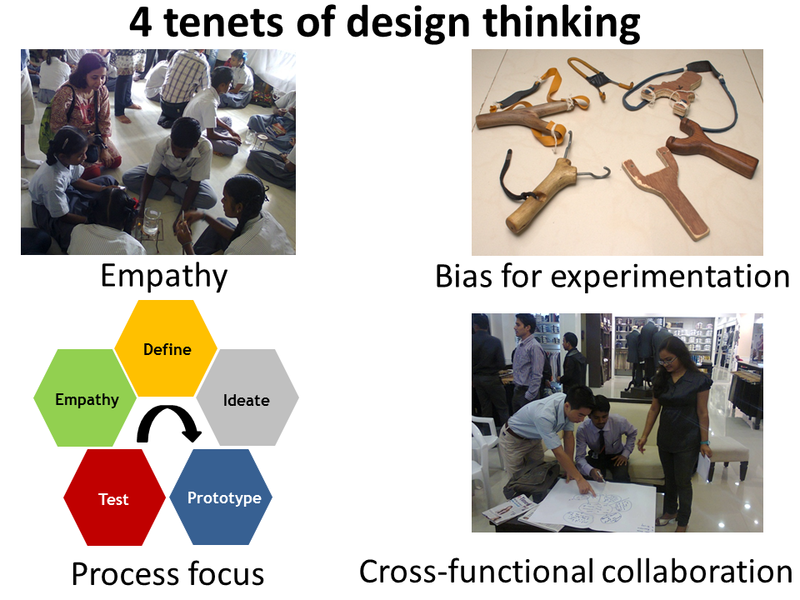 Yesterday I finished evaluating the beta prototypes of 5 of my peers and that finishes my 8 week long course “Design: Creation of artifacts in society” taught by Prof. Karl Ulrich of Wharton School of University of Pennsylvania at coursera.org. I enrolled for this free course more out of curiosity. However, the expectations were so-so. I make a living helping people innovate effectively and I thought I would know most of the stuff. Browsing through the textbook written by the instructor (Ulrich) prior to the course only strengthened this feeling. Today I am glad I did the course and I feel I was so wrong about how much I would learn in the process. The experience just blew me off! Here are 4 things that really impressed me about this course. 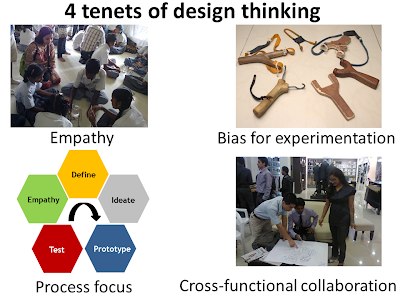 Design thinking (DT) means different things to different people. Here I would like to present my view of 4 core tenets of DT. This view is influenced by various champions of DT such as D-schools at Stanford and Potsdam (especially Lakshman Pachineela & Prof. Ulrich Winberg), Prof. Karl Ulrich of Wharton, Ideo folks (Kelley brothers: David & Tom, Tim Brown), Gandhi, Steve Jobs, and of course, my own experience as a practitioner and an educator. Organizing contests to generate a blockbuster idea or a few best ideas is not a novel concept. You may be familiar with campaigns such as GE’s ecomagination challenge or Economic Times’ “Power of Ideas”. Similarly idea campaigns have been an integral part of innovation programs of various organizations including Cognizant, Intuit, Titan etc. Question is: How do you ensure or at least increase the chance of getting a blockbuster idea through such a campaign? What are the levers that improve the performance of idea campaigns? Prof. Karl Ulrich of Wharton School calls such campaigns innovation tournaments. He along with Prof. Christian Terwiesch (also of Wharton) has written a book titled “Innovation tournament: Creating and selecting exceptional opportunities” that addresses these questions. In this article, let’s look at the 4 levers from the book that Ulrich presents in the Wharton lecture shown above. First let’s start with a definition of innovation tournament.